The Sivananda School of Yoga invites all who attend classes or satsang, and their partners, to a spiritual retreat. If you plan to attend, please inform a teacher or swami. The Hatha Class at 08h30 will be conducted as usual, for non-retreatants and retreatants. Partial attendance is not permitted: it is all or nothing. Only those attending the whole retreat may attend any item between the end of morning satsang and the evening’s satsang. Arrive not later than 5 minutes before early morning meditation. Meditators must remain silent and immobile. There is to be no coughing or clearing of throats. If you can hear yourself moving, you are making too much noise. Unnecessary conversation is to be avoided during lunch and throughout the day. If you are observing Mouna — noble silence and non-communication — when you are not chanting, singing or praying, you should wear a conspicuous notice stating, “Mouna” and avoid eye contact. Sankirtan, group japan, udjayi pranayama, trataka and meditation. 10h30 Questions and answers re Hindu tradition, culture & religion. 11h00 Darshan & Durbar: Question & answer session with H.H. 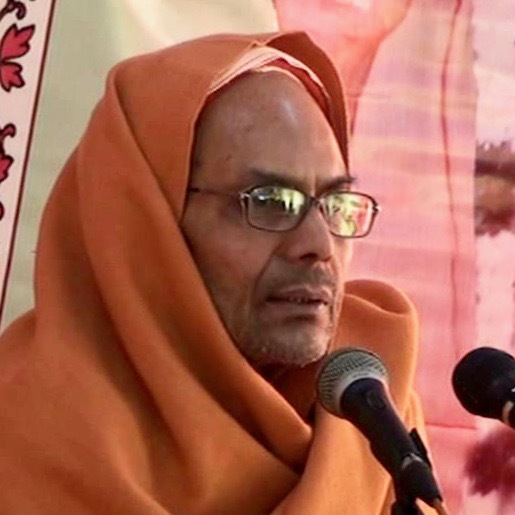 Sri Swami Nirliptanandaji Maharaj, General Secretary of the Divine Life Society of India.